It will take you to the airport or a business meeting in style. 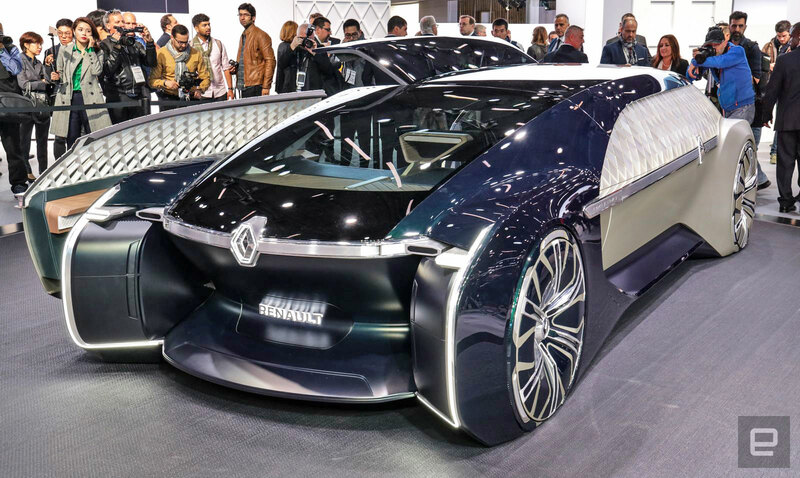 With its last two concept cars, the EZ-GO and EZ-PRO, Renault focused on how autonomous cars could transport people and packages en masse, with a bit of style. With its latest car, the EZ-ULTIMO, the automaker is focusing mostly on the "style" part. Unveiled appropriately at the Paris Auto Show, it's a robotic EV concept that offers a "premium travel experience" rather than basic transportation, coddling occupants in wood, marble and leather. Much like the EZ-GO and EZ-PRO, the EZ-ULTIMO is an all-electric, connected and autonomous vehicle. Renault sees it as a luxury vehicle for hire owned by ride-hailing services, five-star hotels, airlines or businesses. It could be offered to clients as a fancy perk, ferrying folks to a Michelin-starred restaurant, or important business clients from the airport to a hotel. As radical as the other vehicles looked, Renault has amped up the EZ-ULTIMO's styling to another level. Inspired in part by the classic Renault Reinastella, it has a Batmobile-meets-Bentley vibe on the outside, with a spacious "neo-retro" leather, marble and wood interior meant to resemble an old-fashioned Parisian apartment. As opposed to the EZ-GO, which used glass to increase a rider's safety by make them more visible, Renault's latest concept is about privacy. Occupants are invisible thanks to the one-way mirror effect of the "technical faceting" glass on the exterior. It also messes with observers' heads: "At first sight it appears to be deep black in color," Renault explains. "As the vehicle approaches, the light brings out bright and sparkling hints of green.The vehicle's appearance changes as it moves, so it appears to be alive." A smartphone app lets you book the vehicle and access route planning and destination info. Even boarding the vehicle is meant to be an experience. When the large side door opens, the upper glass sections pop up automatically. There's no B-pillar, so you can simply step into the car, and the seats rotate to help you more easily take your place. The EZ-ULTIMO has level 4 self-driving capability, but unlike the EZ-GO, is meant to be taken on highways as well as city roads. Built with the same electric platform as the other two EZ-vehicles, it has front-wheel drive and uses a wireless recharging system. Autonomous driving cameras, radar and LiDAR cameras and sensors are fitted into discreet boxes on the car's corners. Occupants get WiFi via a 5G antenna (5G doesn't exist yet in France, but hey, it's a concept). While the fairings nearly touch the ground, an active suspension raises the vehicle automatically over bumps. And though the vehicle is a whopping 5.8 meters (19 feet) long, four-wheel steering would make it nimble enough for Paris' tight streets -- according to Renault. Finally, at higher speeds, two small side wings deploy behind the rear fairings to improve the aerodynamics. The EZ-ULTIMO completes Renault's trilogy of fantastical concept cars, which help us imagine an autonomous EV future more about ride sharing than private transportation. It's also obviously a way to market its styling and engineering chops, but that alone doesn't justify the expense in developing such costly vehicles. Rather, Renault seems to be making a serious effort to probe cutting edge tech and design in order to help itself -- and the public -- better visualize a world with fewer cars. Follow all the latest news from Paris Auto Show 2018 here!